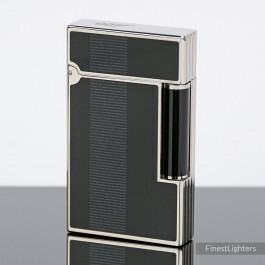 S.T.Dupont Casino Royale Line 2 limited edition lighter was launched in 2006 by S.T.Dupont for the occasion of “Casino Royale” movie. The lighter, inspired by the tuxedo worn by Daniel Craig / James Bond in the movie, is finished in black Chinese lacquer with a stripe which evokes the satin braid of the tuxedo worn by 007 in the movie. Palladium (platinum) trimming. Only 2007 individually numbered lighters were made in the far 2006 (very rare). A great item for 007 lovers and collectors, completely sold out. For more information about S.T. Dupont Casino Royale Limited Edition click here.